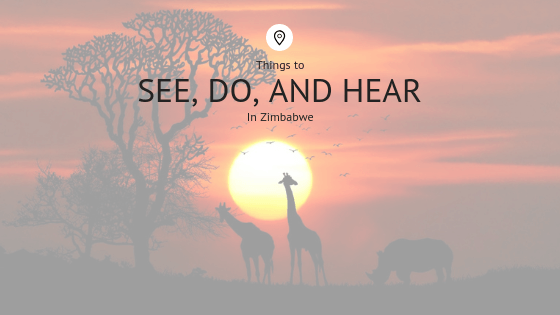 Even though Zimbabwe is not typically known for its tourist trail, it is an amazing destination to explore in Southern Africa. The land has many adventures to offer ranging from Medieval ruins to stunning national parks and even dam cruises. It is a land filled with many offers and many surprises for those who venture into her midst. This is a country that few people know much about, so below are the best things to do and their highlights. Victoria Falls is one of 7 natural wonders of the world, who doesn’t want to check it off their bucket list? Victoria Falls straddles the boarder between Zimbabwe and Zambia. It is not that far from Botswana either which makes it perfect for a stopover on any Southern Africa trip. Stay a night or two at Shoestring Backpackers you are sure to love it. With a pool, bar, cafe, communal kitchen and free wifi, it’s a basic backpackers, but has a great vibe and offers everything from camping to dorm beds and private room accomodation. Peer over the edge of the falls from Devils Pools, bungee jump into the air or white water raft on some great rapids, there is plenty of fun to choose from if you have the budget. Kariba Dam has been known a long time as Zimbabwe’s playground because it is a super relaxing place to chill out with a bunch of friends. It is located about 5 hours from Harare so get a group of mates together and rent a houseboat from Kariba Town, this is an awesome way to experience the Dam. The Dam is one of the largest artificial lakes in the world and definitely one of the best things to do in Zimbabwe. As you sail along the lake, you will see a lot of game, including the Big 5 and some amazing sunsets. Fishing is almost never ending, as well as visiting some of the islands here, so you should allow yourself at least 2 days to get the best from this destination. Matopos National Park is a UNESCO World Heritage Site, and is famous for the numerous boulders that rest on top of each other across the landscape. It is a lot like Devils Marbles in Australia, there are some gorgeous geological formations here that seem to defy gravity! Matopos National Park is located near the city of Bulwayo, and is split between two sections. One section is the recreational area, which showcases the rock art caves, including traditional works by San people. The second section is the game area, which is where you’ll spot your rhinos and your leopards.